What is a Form E in Pakistan? Form E or E Form is an export declaration form which is used for export purpose, in it we declared that this shipment is being processed against the foreign exchange. Form E is issued by the Bank directly to the exporter which is in sets of four copies each (original, duplicate, triplicate and quadruplicate). Shipper can get Form E from his dealing bank along with following supporting documents. 1. NOC: When the shipment is being export against 100% payment in advance so bank issue No Objection Certificate (NOC) to shipper to shipped the shipment directly to buyer. 3. 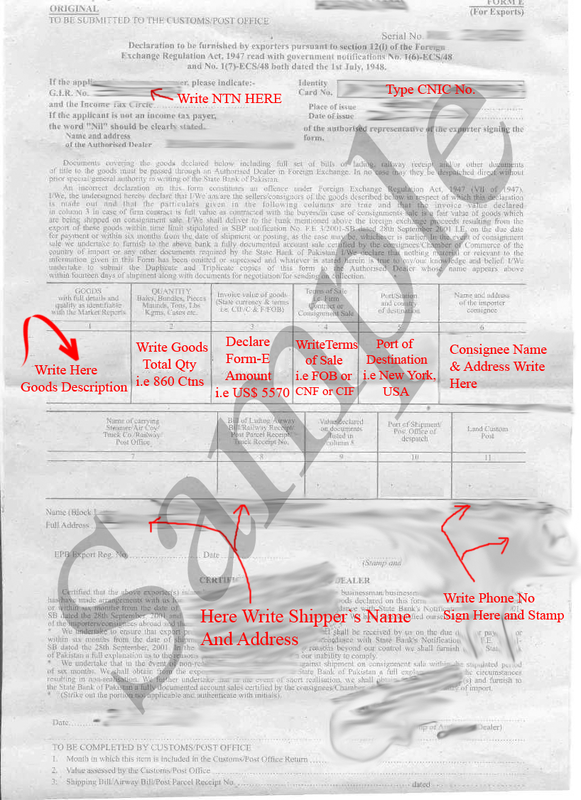 B/L Issuing Authority Letter: This certificate will be issued when the export consignment moved by the sea. In case of by Air export shipment; bank doesn’t issue this certificate. Bank issued four sets of blank Form E (Original Form-E, Duplicate Form-E, Triplicate Form-E and Quadruplicate Form-E) to the shipper. 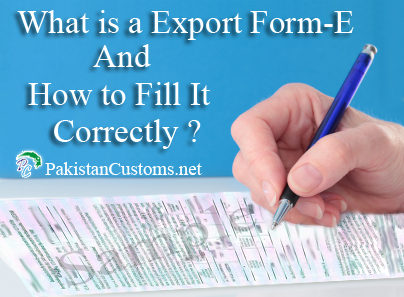 The exporter should submit the full set of Form-E to the bank after it has been completed and signed by the exporter himself or his authorized agent. We write here CNIC number of exporter (Company`s Owner) along with place of issue and date of issue. Here place of issue refers to places from where we got CNIC i.e Karachi, Lahore, Islamabad etc.. and date of issue is a date when CNIC issued to us. Here in this column, we type a complete description of exported goods. Let suppose we want to export garments so we will write Men`s 100% Cotton T-Shirts or Simply Write ReadyMade Garments. Write actual quantity of export goods, the quantity can be in Kgs, Cartons, Bales, Matric Tons, Pieces (PCs), Bundles, etc. Here write terms of sales, according to your contract, i.e. CAD (Cash on Delivery), DA (Documents against Acceptance), DP (Documents against Payment), LC (Letter of Credit) etc..
Write complete name and address of consignee (Buyer). Write the Source of shipment (i.e. By Sea, By Train, By Air etc..) in this column if shipment will move through the vessel (Ship) so write here By Sea in a same manner if shipment will move by plane so we will write here By Air. Here we write exporter name. Here we write exporter address. Write the date when you will verify your Form.E with Bank. While filling Form-E try not to do any mistake, if you mistakenly write something so don`t over write just cut that word and again write next to it, but remember you will have to inform your bank about this correction and bank will place a round stamp (Correction Stamp) on it, without bank`s round stamp correction will not be considered as a valid correction. * Items Banned for Exports In Pakistan.